Vanner Holiday Cottages01341 422854work Self-cateringVanner Farm is a working farm on the banks of the river Mawddach in the village of Llanelltyd and two miles from the market town of Dolgellau. Barmouth is 15 minutes drive away. The panoramic view from this location includes the magnificent Cader Idris range and the beautiful Mawddach estuary winding its way to Cardigan Bay and the seaside town of Barmouth, where you can relax on its beautiful beaches. Vanner Farm is a working farm on the banks of the river Mawddach in the village of Llanelltyd and two miles from the market town of Dolgellau. Barmouth is 15 minutes drive away. On A470, 1.5 miles north of Dolgellau - follow Cymer Abbey signs to the site. Access Statement: The two newly renovated semi-detached cottages are 17th century stone built listed buildings adjacent to Vanner farm house. Hen Dy” was once the servants dwelling and Y Bwtri” the old buttery. •	The cottages are approached from the courtyard. •	Luggage can be unloaded outside the door. •	Parking on rolled gravel at the front or rear of the building and access via flat uneven surface. •	The cottages are part of a working farm and have access via an uneven slope to the nearby river Mawddach and riverside walk. •	Local taxis service the premises. 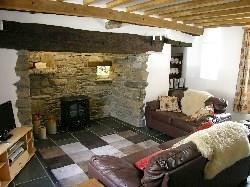 •	Both cottages have flagstone floors on ground level and oak stairways and first floors. •	Mobile telephone coverage is poor within the cottages due to the thickness of the stone walls. •	Light switches and power points at a sensible height throughout the buildings. •	The owners live on site at the farm house and are available whenever possible. Lockable utility room: •	Attached to the cottages, access via uneven flat surface. •	Standard sized washing machine and tumble drier. •	Standard ironing board and iron. •	Drawer freezer. •	Wet clothes hanging facility. •	Bike storage. Hen Dy (5 person) •	Entrance via wide stable doorway. •	Wide entrance hall and ground floor bathroom with w/c, cloakroom sink and sizable shower unit. 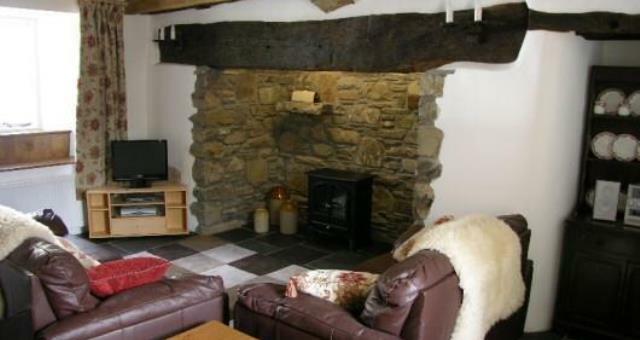 •	Comfortable sitting room with many features including large inglenook with open bread oven. Access via small step. •	Open plan dining room/ kitchen. Access via small step. •	Two bedrooms via oak stairway. •	Exposed oak beams, many original, throughout first floor. •	First floor bathroom with standard sized sink, bath and w/c. •	One bedroom has one double bed and second bedroom has one double and one single bed. •	Non-feather pillows and duvets with poly-cotton covers and sheets. Cotton sheets and pillowcases available on request. Y Bwtri (2 person) •	Entrance via wide stable doorway and small downward step. •	Ground floor bedroom with one double bed. •	Non-feather pillows and duvets with poly -cotton covers and sheets. Cotton sheets and pillowcases available on request. •	Ground floor bathroom with w/c, sink and sizable shower unit. •	Open plan first floor sitting room/ dining area and kitchen overlooking the ruins of Cymer Abbey. •	Access to first floor via oak stairway plus access from outside via stone steps.